This question has been asked by everyone at some point in time. SNL made a skit about it, because you would have to be blind to not see Clark Kent is Superman. Yet for years no one has made the connection, so how does Superman do it? Well, the answer comes to us from issue 330 of Superman titled "The Master Mesmerizer of Metropolis". Clark's glasses are the real reason people can not tell he's Superman. Superman's eyes give off a low level hypnotic effect. Clark examined the wreckage of his Kryptonian rocket finding a Plexiglass window shattered which will cause Hypnosis to humans. When he wears his glasses made of the Kryptonian plexiglass material, it amplifies that effect to make people see him as a different and normal individual. Shocking isn't it? All those years and the answer has been there all along. Below is the story that explains Superman's ability to hypnotize people and while it may be a bit odd, at least there is a logical reason as to why no one has discovered his secret identity. The story opens with Clark Kent waking up in bed, quite rattled from a nightmare of a satellite falling out of orbit and is headed straight at them in his office building. To Clark's astonishment, Lois Lane, Jimmy Olsen and Lana Lang urge him to change into his Superman suit. His close friends have apparently seen through him such as Lang. Lana refers to it as a silly blue suit. Now wide awake, Clark wonders why his disguise has seemingly fooled millions for so many years and finds out that Metropolis is being attacked by a super-villain called The Spellbinder, who induces mass-hypnosis to get folks to do just about anything at his command. After a battle between Superman and Spellbinder, Superman figures out why his super self-hypnosis failed to protect him from The Spellbinder. Superman is then amazingly able to use his own super-hypnosis power to all but insure that every person in Metropolis won't be affected by The Spellbinder. Superman heads back to work and changes from his Superman costume but then Lana Lang interrupts him. To Superman’s astonishment Lana fails to recognize that he's Superman changing to Clark. What she sees is just Superman holding glasses! 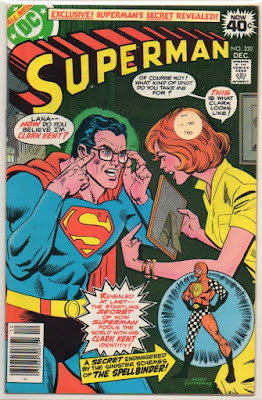 Lana explains to Superman that she knows Clark, and that he has a phony similarity at best! Lana says that Superman’s too heavily built much too handsome for Clark. Superman then asks why Lana thinks this. She explains that she never knew how Superman could change his appearance so drastically if he was Clark. Clark is left confused as to why Lana sees him as Superman and not Clark. Then Spellbinder is at it again and Clark determines that he's got to self-hypnotize himself against the villain to also become immune. Before long, Superman begins another battle with The Spellbinder. Superman mistakenly believes that The Spellbinder's hypnosis won't effect him. However, The Spellbinder is able to convince him that he's lost his powers. 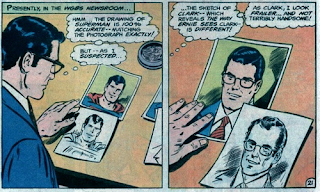 After The Spellbinder wins and leaves the scene, Superman figures out why his super self-hypnosis failed to protect him from The Spellbinder and why Lana couldn't recognize him as Clark. He doesn't say yet to keep readers in suspense. Superman is able to avoid another dose of hypnosis from The Spellbinder after realizing that the villain is using SOUND for hypnosis. Using special earplugs, Superman is able to resist The Spellbinder's hypnosis and defeat him.